Card Tagle calls on the faithful to save money to donate on Ash Wednesday for solidarity initiatives, especially for the people affected by last year's earthquakes and super-typhoon Yolanda. The campaign will benefit children aged six months to 12 years and their parents who will be offered training courses and seminars. Manila (AsiaNews/CBCP) - On the first day of Lent, Pondo ng Pinoy, a charity founded by Card Gaudencio Rosales, has launched anew its campaign to raise money to feed at least 250,000 malnourished children across the country. Called 'Fast2Feed', the fund-raising campaign is aimed at the faithful, encouraging them to save money to buy food on 5 March, Ash Wednesday, a day of fasting for Catholics. 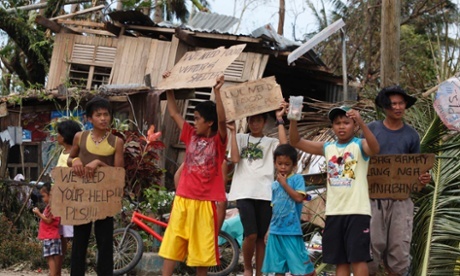 Card Luis Antonio Tagle, archbishop of Manila, is leading the initiative, calling on the community to give money to help malnourished children, especially those affected by earthquakes or last November's typhoon Yolanda. The cardinal chairs the Pondo ng Pinoy foundation, which implements the Hapag Asa aid programme. At least 50,000 of the targeted 250,000 children "come from areas struck by natural disasters" the last year, he said. The campaign covers the earthquake-hit dioceses of Bohol and Cebu, the Archdiocese of Zamboanga, which has been torn by ten years fighting involving Islamic and separatist groups, and the central Visayas region, which was devastated by the super-typhoon. In order to ease the suffering of malnourished children, Hapag Asa is trying to boost feeding campaigns in concerned dioceses. The campaign touches children aged six months to 12 years, who get nutritious food and care once a day, five days a week, for at least six months. The cost for six months is 600 pesos (just over US$ 10) per child. In addition to food for the children, the programme also helps the parents to care better for their children as well as provides them with information and basic skills to apply for jobs or start their own business. Established in 2004 by then Archbishop of Manila, Pondo ng Pinoy has given Filipinos an opportunity to help others without too much of a fuss. According to the latest figures for the 2012-13 fiscal year, the programme raised a total of 15.8 million pesos, or US$ 260,000. The bulk of donations (7.9 million pesos) come from the parishes of Metro Manila, followed by Malolos and Antipolos with 972,000 pesos each. Through this initiative, the Church wants to encourage people to donate 25 cents a day in every parish and school, as a permanent act of solidarity. As Filipino saying suggests, "Anything good, no matter how small but done frequently, leads to salvation" (Anumang maliit, just malimit patungong ay langit). Malnourished children in India, a "national shame"